Amid their travels across Europe, Alli and Jarred, both from Edinburgh, found in Berlin a perfect nest for a new home and their dream business. 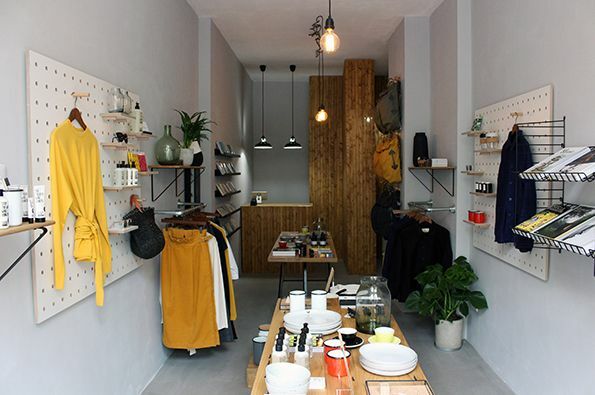 Argot Life Store opened its doors this spring, displaying a selection of independent brands close to the owner’s souls, each given a place to shine in the small, but thoroughly considered space in Brunnenstrasse, one of the coolest areas in Mitte. You’ve landed in the greatest hub for creatives of all kind – a city with an impressive scene for independent design shops. How does that feel for a freshly opened store like ARGOT? It feels exciting! One of the things we loved most about the city when we used to visit in the past, was its extensive independent shopping scene. There are so many inspiring stores to visit all over the city, and it’s so diverse! That’s why we chose to move to Berlin to live and open our store. We knew our idea would work here. Berlin has such a creative and “can do “ approach to business. I think people respect the fact that you are doing things for yourself and are making your dream a reality. It is a lot of hard work and you do make mistakes but hearing people say they love the store, or helping someone find the perfect gift makes it totally worth it. Citing your description, ARGOT’s selection and philosophy stands as a mirror for both of your personalities and lifestyle. Can you tell us more about that? We used to travel quite a lot and loved checking out each city’s independent shopping scene. We picked up a lot of ideas for the design of the shop and the brands we wanted to showcase. Our goal was to create a space both inspiring and functional. Somewhere both men and women would feel comfortable in and discover new brands. A curated space where things were aspirational but also attainable. The layout of the store is very considered, in part because the store is so small, but also because we hate when stores just pack out the shelves. We want to give the products the space they deserve and a chance to shine! How do you curate the items in your store? Which are the most important criteria? Well we definitely have to like the product! We would never sell anything we wouldn’t choose to have or use ourselves. We spent a lot of time in the planning stages researching potential brands. Some items we discovered on our travels like Stop The Water While Using Me! Which they use in the 25 Hour Bikini Hotel, our base for one of our many trips to Berlin. Other brands we discovered on Instagram like NEUL. I then hunted them down so I could check the feel and fit. The quality is amazing so they went on the yes list! We are very conscious to be gender neutral where possible. We want our store to appeal to both men and women. I’ve worked in shops previously that just have a giant holding area for men to just wait it out. I say get involved! Our store is for everyone! We pick products that have a strong sense of design and that are functional. Our store is small so there is no room for messing about. All our products serve a purpose and are there for a reason and we love it! Are there any plans for a second store in the near future? Not at the moment, but there are plans to develop our online store. We ship only to Europe at the moment, but would love to expand to the rest of the world too! Can each of you pick a favorite item in your shop right now? Alli’s changes every week! Currently coveting a pair of high waisted black cords from NEUL. Jarred’s got his eye on a Millican Duffle bag. Who knows, maybe Santa will make us very happy! 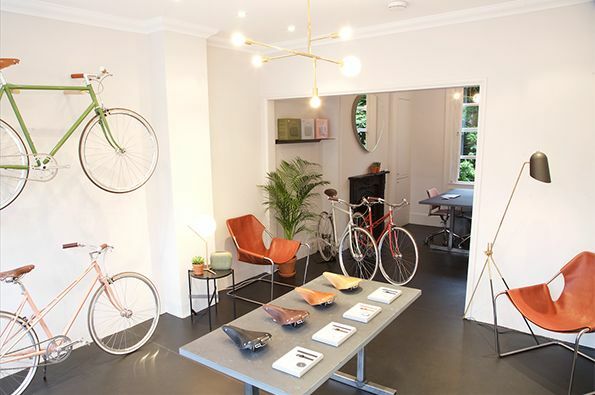 It hasn’t been too long since British brand Freddie Grubb opened its doors on London’s Amwell Street, a fresh and funky shop front in a somewhat residential area, with plenty of lovely independent stores. Named after the maverick pioneer of British cycling, a Freddie-Grubb-signed bike is a contemporary take on the traditional bike: a piece for those with a modern sense of the road, willing to add a drop of style to the everyday cycling. And there’s more to this shop’s story: here you’ll find a curated selection of accessories and home furnishings, all in the same refined style. Here’s our chat with co-founder Jack Pattison, giving us a look behind the scenes of his store. HS: How did Freddie Grubb grow from an idea to an actual store? Freddie Grubb has been a labour of love. What began as a silly conversation in the pub soon snowballed into a genuine business opportunity. We got heavily involved in every aspect and detail of the bike which meant the design and prototype stage took 12 months longer then we expected. This was really valuable time in which to hone the design. Having a stand-alone shop is really important for us as a start-up bicycle brand. Customers can come and be fitted correctly, test ride the bikes and give us their feedback. It’s also essential to have a somewhere convenient where we can offer servicing and after sales support. HS: How did you pick Islington as an area to open up your shop and what would you say Freddie Grubb adds to the district? We run business from the shop so it was important we had a shop that we could work in as well as sell bikes from. We always wanted it to be a destination shop, somewhere easy enough to get to but also quiet enough for customers to enjoy test rides safely. 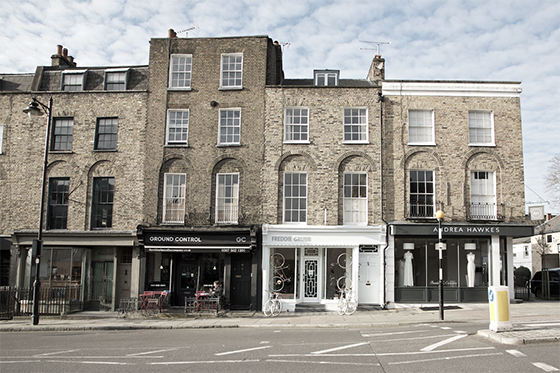 Amwell St. is a charming Georgian parade of shops – it ticks all the boxes. HS: Tell us a little bit about your design approach: your references and inspiration. We set ourselves the brief to design a bike with a comfortable, clean frame that will ride really well. 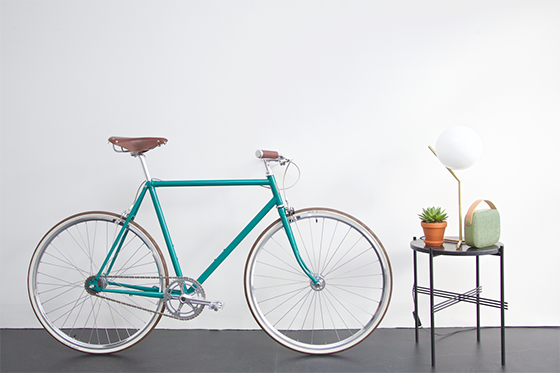 The designs are all inspired by classic 50’s British road frames but with a modern geometry. Once we established this, we could focus on the details – which are really important to our design ethos. We stripped back anything unnecessary and focussed on elements that some major manufacturers leave as an after-thought or add on. HS: Who produces your bicycles? Each Freddie Grubb bicycle is built to order with care and precision, one at a time, by our mechanic Gordon. Building them in this way means that we can be flexible and make small changes and customisations if necessary. HS: How would you describe your clientele? What are the main reasons someone choses to buy a Freddie Grubb bike? Our clientele are design conscious and generally people who have an eye for detail that are willing to pay a little bit more for quality. People who understand the merit of paying a little bit more for something that will last. There are 3 main reasons for buying a Freddie Grubb. Quality, Comfort and style. Why compromise? HS: How do you curate the other items in your shop: where do they come from? We have a few choice partner brands we work with all of whom share the same design ethos. Detail and quality. 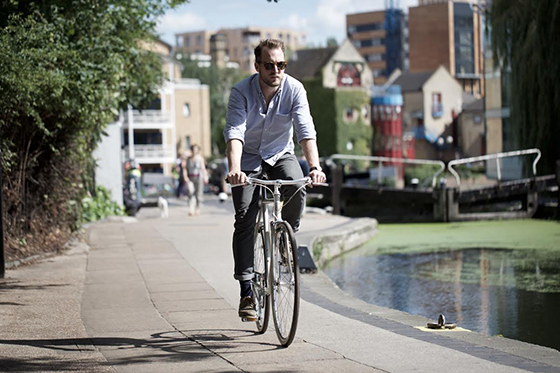 HS: What’s your idea of a favourite ride across London? Easy. Starting at the Freddie Grubb store in Islington, dropping down onto the canal and following it all the way to Crete Brewery in Hackney Wick. Its a beautiful car free route with plenty of opportunities to shop on the way. There’s an amazing cafe called Towpath that serves the best coffee where you can sit on the side of the canal and watch other bikes go past. After that there’s Broadway Market, Victoria park, the Olympic park and finishing at a Brewery that also make the most incredible pizzas. Fortunately it’s not far for me to roll home afterwards too.